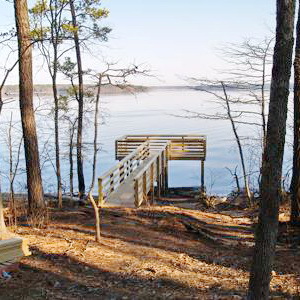 In a collaborative project, the New Hope Audubon Society, the US Army Corps of Engineers, and the NC Wildlife Resources Commission have constructed a Wildlife Observation Platform on Jordan Lake. 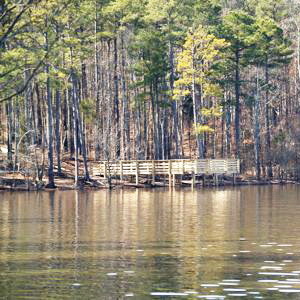 The platform is at a site off Martha’s Chapel Road in Chatham County, NC, and includes trails and a great view to the north up Jordan Lake towards nesting areas of bald eagles, ospreys, and other bird species. We of New Hope Audubon owe a big thank you to Garry Scronce and his crew. The platform is a solid and professional viewing structure that would have been difficult for us to pull off without their able leadership. And within NC Wildlife, we had active participation from Wildlife Diversity, Game Lands, Engineering, and Enforcement staff.